1. Denard Robinson is a unique and special player that only comes along once in a great while. He is roughly 90% of our total offense, but that's not really such a bad thing. The pace he is setting is staggering, and will likely not continue once we play better defenses in the Big Ten. But there is no doubt that he's easily the most exciting player in the country. Not surprisingly, Denard leads the nation in rushing. #2 on the list is RB LaMichael James from Oregon with 712 yards. The next QB on the top rushing list is Nebraska's QB Taylor Martinez at #11 with 496 yards. Robinson accounted for 494 yards of total offense and five touchdowns, including the game-winning score with 17 seconds left at Indiana. The sophomore quarterback completed 10 of 16 passes (62.5 pct.) for a career-best 277 yards and three touchdowns and added 19 carries for 217 yards (11.4 avg.) and two more scores against the Hoosiers. He is the first player in Football Bowl Subdivision history to pass and rush for 200 yards in a game twice during the regular season, also accomplishing the feat at Notre Dame on Sept. 11. The Florida native averaged 14.1 yards on each of his 35 touches in Bloomington, including a 72-yard touchdown run on the Wolverines’ first offensive possession. 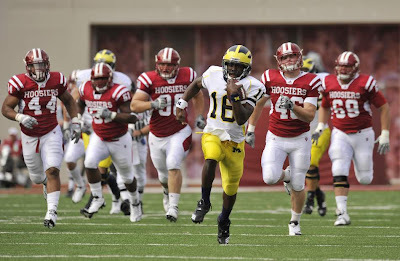 After Indiana tied the score at 35-35 with only 1:15 left in the game, Robinson led Michigan on a five-play, 73-yard drive, capped by his four-yard scoring run for the victory. His 494 total offensive yards ranks second in school history behind only his 502-yard performance at Notre Dame. Robinson has earned offensive accolades in three of the first five weeks of the season, the first weekly awards of his career. 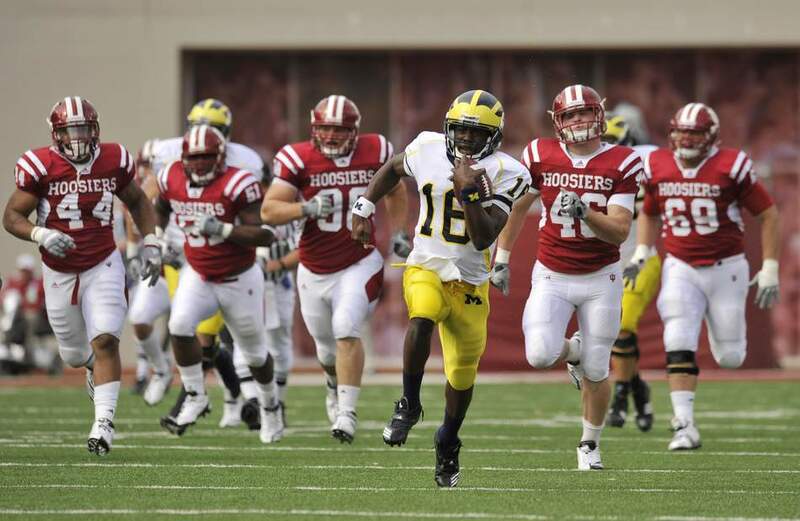 LAST MICH OFFENSIVE POW: QB Denard Robinson on Sept. 13, 2010. He may be the most talented overall player in the nation, he may not. But either way, it's clear that Rodriguez has designed a system that allows Robinson to thrive and showcase his talents. For that reason alone, I'm sold on Rich Rodriguez as the coach of these Michigan Wolverines. I don't see any other coach in the country who could orchestrate a system like this that is so tailored to one player, but can easily be adapted to a Forcier if Denard gets hurt. That is a very good sign for a head coach and an offensive coaching staff. Our offense is pretty much unstoppable at this moment. What a far cry from not knowing who the starting QB was going to be just 5 weeks ago. 2. Michigan's defense is just not good. For as much fun has Denard is to watch, our defense is exactly the opposite. I mean there are times when we do some things right. We did stop Indiana's very good passing attack a few times for 3-and-outs, but clearly not enough. Indiana is a very good passing team with Ben Chappell, and Doss is a big time playmaker, but his numbers on Saturday were way too good. I don't know what's going on with Greg Robinson and his very soft zone. Maybe the huge plays we gave up in the early weeks of the season have made GRob go ultra-conservative. But all day long, our corners played 7-10 yards off the Indiana receivers. We didn't even try to mix it up. And our pass rush was usually just Martin, Banks and Van Bergen...with the linebackers going back into coverage. Very strange moment indeed. GRob almost looked apologetic...which wouldn't be too hard to believe. I think it's safe to say that Jonas Mouton has regressed this year. Not that he was all that great last year, but expectations for the senior LB were that he would improve. The same can be said for Ezeh. These guys would be better off blitzing much more often than dropping back into coverage, especially in the red-zone. We must get more pressure on the QB. As good as Martin is, a 3-man rush isn't going to cut it. Ultimately, our offense is good enough to keep us in pretty much any game. The defense is the wild-card. If we can limit the penalties and not turn the ball over, we'll at least give ourselves a shot. It doesn't get much bigger than this weekend when 5-0 Sparty comes to town. We'll have plenty to say this week about this game. Let the fun begin!